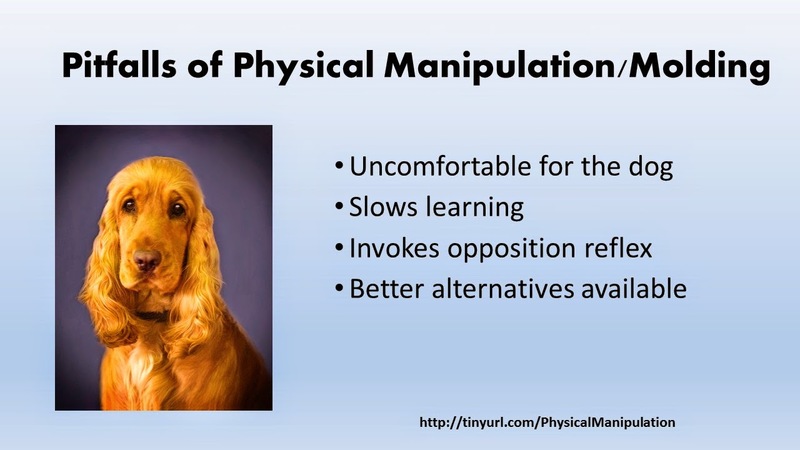 In his Handbook of Applied Behavior Steven Lindsay writes that when we use physical manipulation to get a dog to sit, the dog is sitting to avoid being pushed on - less pleasurable for the dog. In his book, Before and After Getting Your New Puppy, Ian Dunbar suggests that all training be "hands off"
In her book Reaching the Animal Mind, Karen Pryor writes about a study where volunteers used very gentle physical manipulation but they couldn't complete the study because the volunteers felt so bad for the dogs. The volunteers noticed a lot of calming signals from the dogs. a. If a dog won’t sit or lay down for you, it might be because it is painful or difficult for him/her. Or it might be because he/she is nervous and feeling vulnerable. "Many humans think physical manipulation of a dog is probably no big deal, compared to pinch collars or electric shock — but to many dogs, particularly anxious dogs, it can be very aversive. Quite often handlers are surprised to learn their cues are poisoned, but the difference in response tells the tale!" "Not only is it aversive to squish dogs into sits and downs, strangle them into heeling, and jerk them towards you with leashes to obtain approaches, the dog is made a passive victim of the training rather than an active participant, and so learning is slower." "From a learning perspective, even gentle physical handling of your dog is unhelpful. Since there's no advantage to physical manipulation for training behaviors, I can't think of a reason to use it." "Physical touch masks learning and prolongs the process, making molding an inefficient approach for teaching behavior. Methods that employ molding generally require dozens of repetitions for the dog to recognize the behavior being trained. Further, any role the trainer plays in physically achieving a behavior will have to be faded-a process of gradually and progressively weaning the dog off the help." "Pushing down on its rump, holding, or otherwise manipulating the pet must be avoided. Physical force is at the root of most submissive behavior and interferes with effective learning."